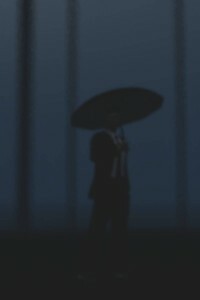 I was trying trying to get a pretty specific particle effect with Vue tonight – rain hitting an umbrella and cascading off. I’ve not found a good way to achieve it yet. Anyway before I shut Vue down I had a silly idea to see what the image would look like if I focused the camera in front of the figure. This is the result. I’m not really sure if I like it or not. What do you think?